Cash games or tournaments? While in Macau, Guo Dong tells us why his preference is for tournaments. PokerNews caught up with Guo Dong at PokerStars Championship Macau for some tournament talk. The PokerStars Championship presented by Monte-Carlo Casino® has already begun in Monaco, with the first events of a 71-tournament series having gotten underway. Today begins one of the first marquee events on the schedule, the €100,000 Super High Roller, with other high rollers and the €5,300 Main Event still to come. PokerStars Championship Macau wrapped up not too long ago, where Guo Dong of Beijing was among the many players doing well. Dong made a deep run in the PSC Macau Main Event, finishing 10th, and also made a final table in another NL event, adding further to his career tournament earnings which now near $940,000 total. Our Sarah Herring caught up with Dong in Macau to talk about a couple of different topics of particular interest to tournament poker players. 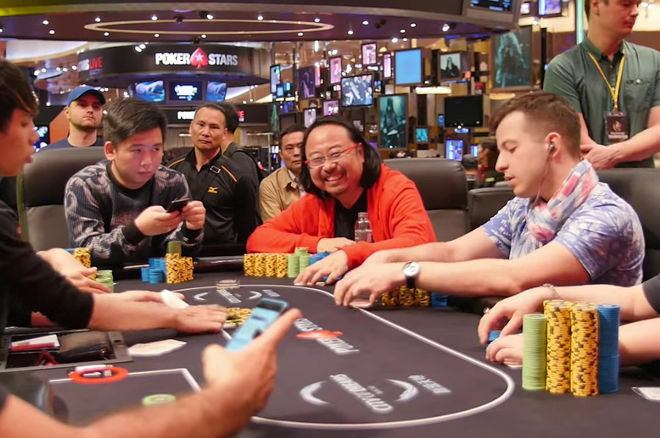 One concerned the grind of playing a long, multi-event series, with Dong describing himself having recently begun to adopt a different approach that better suited him. Rather than play as many events as possible, Dong has been more selective about the tournaments he plays with an eye towards doing better while playing fewer events — going for quality, not quantity. He's also looking at structures more carefully and choosing ones that better fit his skill set and playing style. In his case, that means playing the slower-structured events that allow for more play and postflop decision-making. Such considerations — along with a player's bankroll — are important when approaching a long series, something covered here recently in an article titled "World Series of Poker: Which Tournaments Should I Play?" The conversation then turned to the announcement last December that the Global Poker League will be launching in China this year, which led to some further discussion about efforts to increase the popularity of poker tournaments in China (versus cash games). Dong shares thoughts about the difference between cash games and tournaments, likening cash games to fishing where you are often "waiting for a bite" while describing tournaments as being more like a competitive sport. He touches upon ideas covered in articles like "Making the Transition from Cash Games to Tournaments" and "Why I Am a Tournament Poker Player"
For what reasons do you prefer tournaments or cash games? Share your thoughts in a comment below. Meanwhile, stick with PokerNews over the next week-and-a-half for live updates, photos, videos and more from the PokerStars Championship presented by Monte-Carlo Casino®.